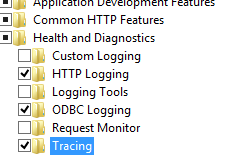 The <tracing> section group contains failed request tracing settings that you have configured and contains trace provider definitions provided during installation or by you on the Internet Information Services (IIS) 7 Web server. Request-based tracing provides a great way to figure out what exactly is happening with your requests and why it's happening, provided you can reproduce the problem the server is experiencing. Problems like poor performance on some requests, authentication-related failures on other requests, or HTTP 500 status code errors from Active Server Pages (ASP) or ASP.NET can often be incredibly difficult to troubleshoot unless you have captured the trace of the problem when it occurs. Failed-request tracing is designed to buffer the trace events for a request and only flush them to disk when a request fails based on a failure definition that you provide. 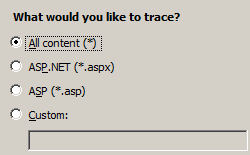 IIS 7 only displays these messages after you install and enable the Tracing module. It stores these messages and other tracing information in a special file named the failed event tracing log file. You can open these files in a Web browser and review the trace events generated by IIS, the custom trace events generated by third-party modules, or both. 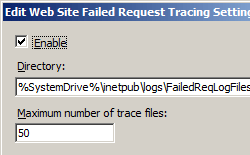 By default, IIS 7 stores these files in the %systemroot%\inetpub\logs\FailedReqLogFiles folder. The <tracing> section contains a <traceFailedRequests> element and a <traceProviderDefinition> element. The first element configures failed request tracing for your Web site or application, and the second element defines the tracing providers available on the server. 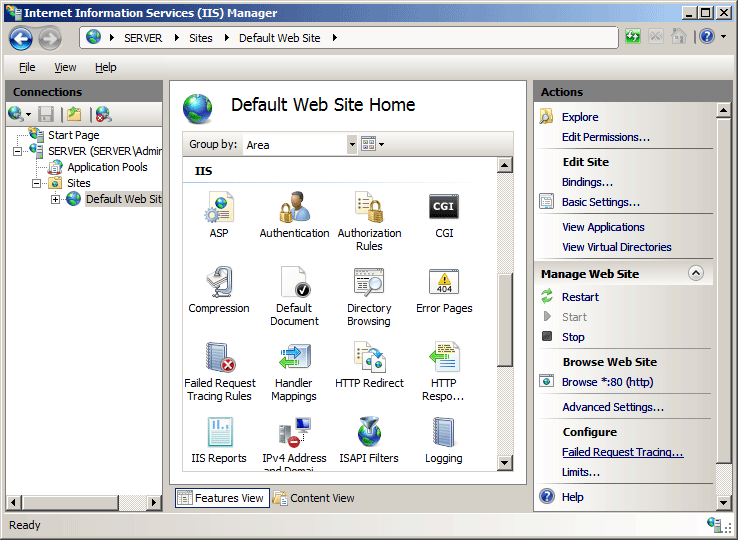 By default, IIS 7 includes tracing providers for ASP, ASP.NET, Internet Server API (ISAPI) extensions and the Web server itself. You can also include custom tracing providers. 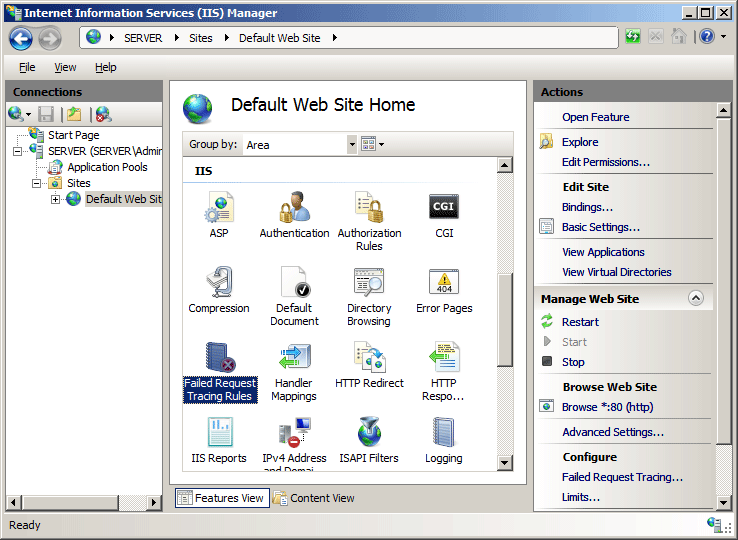 IIS 10.0 The <tracing> element was not modified in IIS 10.0. IIS 8.5 The <tracing> element was not modified in IIS 8.5. 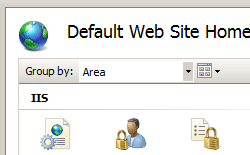 IIS 8.0 The <tracing> element was not modified in IIS 8.0. 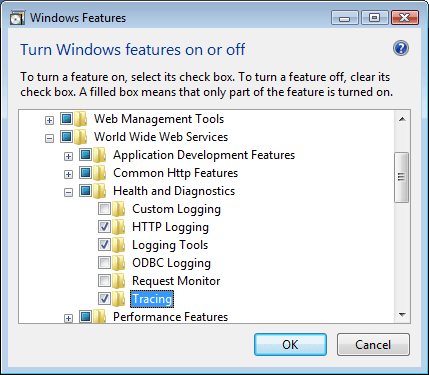 IIS 7.5 The <tracing> element was not modified in IIS 7.5. 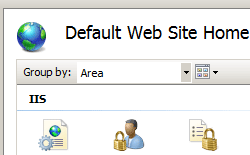 IIS 7.0 The <tracing> element was introduced in IIS 7.0. 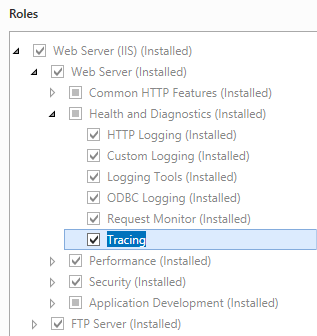 After you finish the default installation of IIS 7 and later, you must install the tracing role service to use failed request tracing. After you install the role service, you still must enable failed request tracing at the site level, application level, or directory level. On the Server Roles page, expand Web Server (IIS), expand Web Server, expand Health and Diagnostics, and then select Tracing. Click Next. Expand Internet Information Services, expand World Wide Web Services, expand Health and Diagnostics, and then select Tracing. 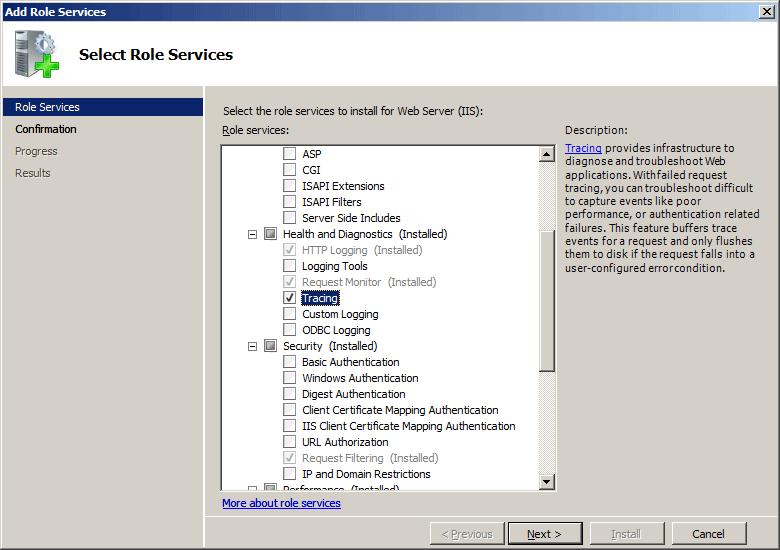 On the Select Role Services page of the Add Role Services Wizard, select Tracing, and then click Next. Expand Internet Information Services, then World Wide Web Services, then Health and Diagnostics. Select Tracing, and then click OK. 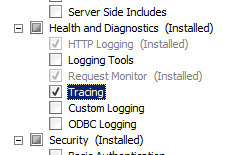 In the Connections pane, select the server connection, site, application, or directory for which you want to configure failed request tracing. In the Edit Web Site Failed Request Tracing Settings dialog box, select the Enable check box to enable tracing, leave the default value or type a new directory where you want to store failed request log files in the Directory box, type the number of failed request trace files you want to store in the Maximum number of trace files box, and then click OK. 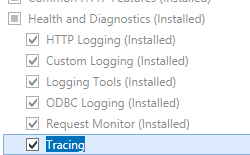 In the Connections pane, go to the connection, site, application, or directory for which you want to configure failed request tracing. 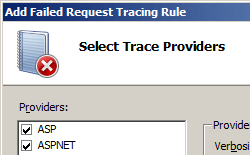 In the Home pane, double-click Failed Request Tracing Rules. 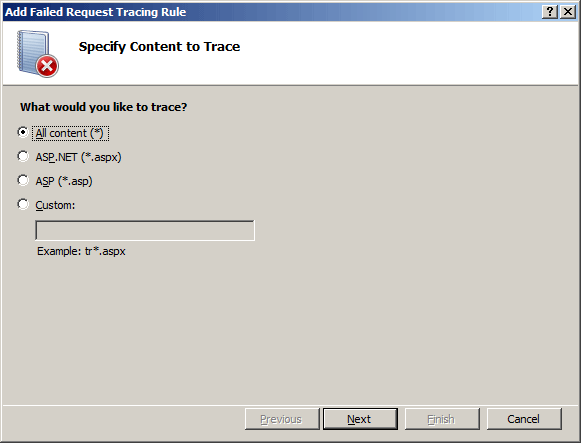 On the Specify Content to Trace page of the Add Failed Request Tracing Rule Wizard, select the content type you want to trace, and then click Next. 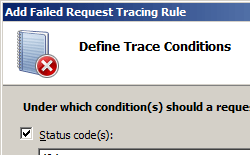 On the Define Trace Conditions page, select the conditions you want to trace, and then click Next. Trace conditions can include any combination of status codes, a time limit that a request should take, or the event severity. 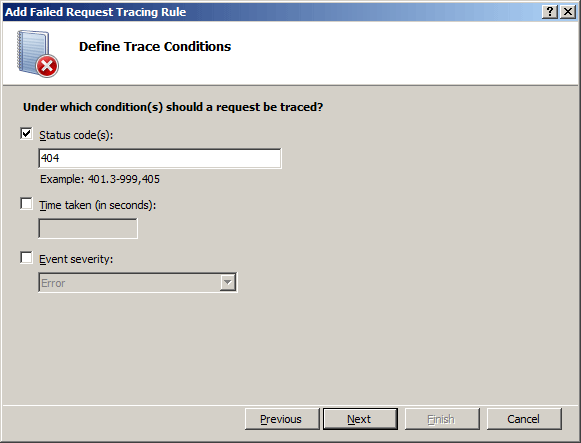 If you specify all conditions, the first condition that is met generates the failed request trace log file. 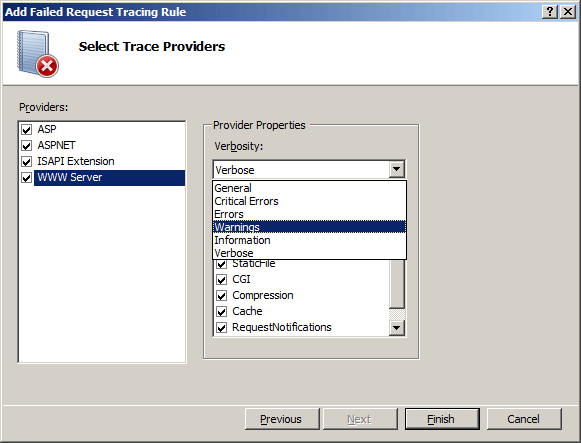 On the Select Trace Providers page, select one or more of the trace providers under Providers. On the Select Trace Providers page, select one or more of the verbosity levels under Verbosity. 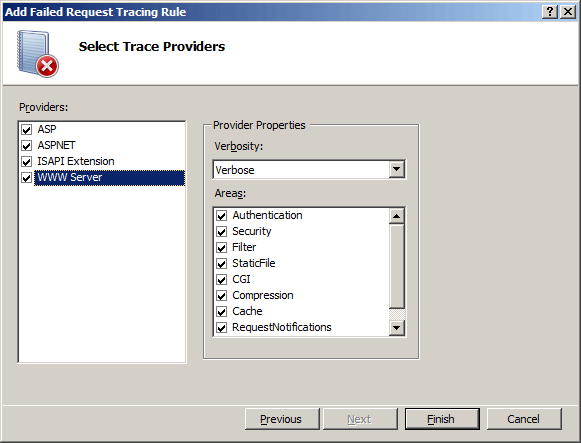 If you selected the ASPNET or WWW Server trace provider in step 8, select one or more functional areas for the provider to trace under Areas of the Select Trace Providers page. You can configure the <tracing> section group at the server level in the ApplicationHost.config file or at the site level, application level, or directory level in a Web.config file. 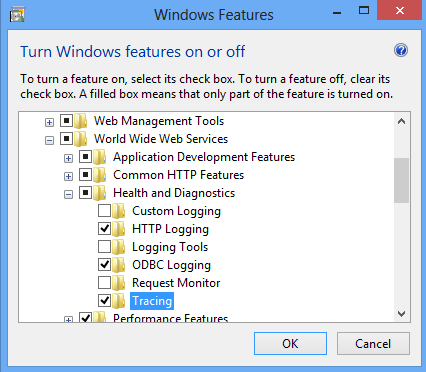 Contains settings for tracing failed requests on the Web server. Defines the trace providers that are used on the Web server. The following configuration example configures tracing at the server level in the ApplicationHost.config file. 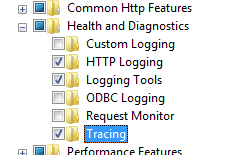 It sets tracing for all .aspx files, uses the <traceAreas> element to set the ASPNET provider and trace against all ASP.NET areas, which are Infrastructure, Module, Page and AppServices. 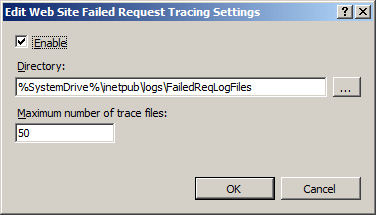 The sample also uses the verbosity attribute to set the amount of information returned to the tracing file to warning. Lastly, the sample uses the <failureDefinitions> element to trace only requests that generate a HTTP 404 status code. The following examples enable verbose failed request tracing for HTTP 500 errors in ASP.NET content on all requests to *.aspx pages. appcmd.exe set config "Contoso" -section:system.webServer/tracing/traceFailedRequests /+"[path='*.aspx']"
appcmd.exe set config "Contoso" -section:system.webServer/tracing/traceFailedRequests /+"[path='*.aspx'].traceAreas. [provider='ASPNET',areas='Infrastructure,Module,Page,AppServices',verbosity='Verbose']"
appcmd.exe set config "Contoso" -section:system.webServer/tracing/traceFailedRequests /[path='*.aspx'].failureDefinitions.statusCodes:"500"